In the old days at Marlborough House, when the late King was Prince of Wales, says a writer in the Lady’s Realm, the exclusive afternoon tea parties given by the then Princess of Wales to her most intimate friends in the celebrated “Marlborough House” set were a special and most delightful feature of Royal hospitality. This season Queen Alexandra has revived this form of entertainments, though naturally Her Majesty’s guests are strictly limited in number and are confined to members of the Royal family or those honored with Queen Alexandra’s most intimate friendship. Afternoon tea when guests are present is usually served in the Red Saloon, one of perhaps the most beautiful apartments in Marlborough House. 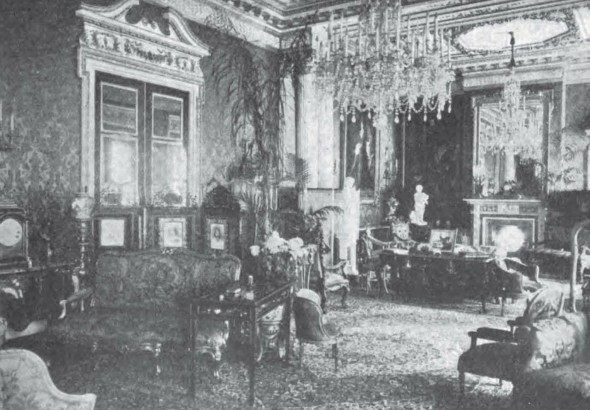 It is one of the spacious reception rooms on the first floor, and Queen Alexandra particularly interested herself in its furnishing when Marlborough House was being rearranged for Her Majesty after King Edward’s death. The room is full of interesting things. On a large table near the fireplace there is a book of sketches done by various royalties which always interests Her Majesty’s guests. Many of the sketches are portraits; a particularly interesting and clever one is a sketch of the present King and Queen done by the Dowager Empress of Russia. It was done at Marlborough House shortly after their Majesties’ wedding. Other royal sketches are by the Duchess of Fife, the German Empress, and Queen Victoria. Near a beautiful tapestry settee, a present to Queen Alexandra from the Czarina, is a case containing part of Queen Alexandra’s collection of antique jewel boxes. It is a priceless collection and every box has an authenticated history, some of the French jewelled boxes are of the fourteenth century. One of these was, by the way, an anonymous present to the late King; it came apparently from China, but who the donor was never transpired. The most recent addition to the treasures in this beautiful apartment is a clock, said to be five hundred years old. It stands on a table near to the eastern entrance to the apartment. Afternoon tea is served at four o’clock and is quite an informal entertainment. 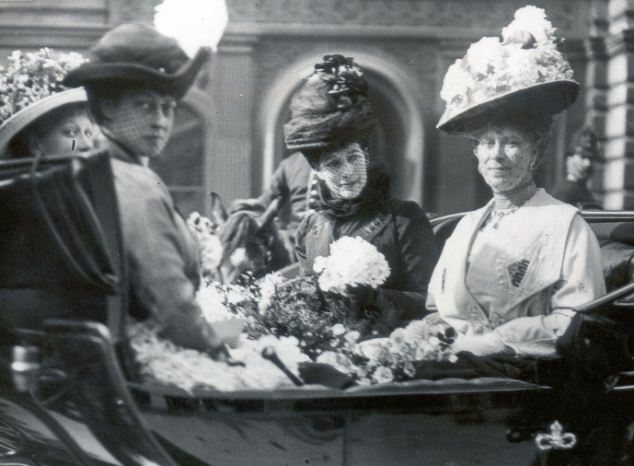 The guests who would probably not number more than half a dozen arrive a few minutes before the hour, and at four, Queen Alexandra, accompanied by Miss Charlotte Knollys, enters the room. The guests, of course, all rise at the entrance of their Royal hostess and Queen Alexandra shakes hands with each. Tea is generally poured out by Miss Knollys; though if the guests are very few this office is sometimes performed by Queen Alexandra. 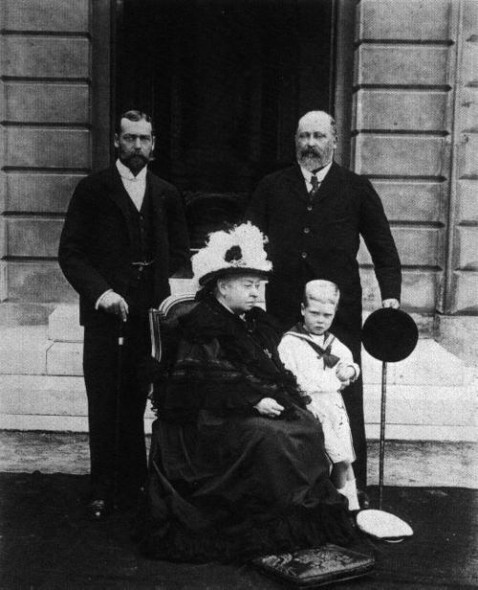 The cakes, sandwiches, etc., are handed round by one or two of the younger members of Queen Alexandra’s household, who are usually in attendance on such occasions. It should perhaps be explained that with the exception of Miss Knollys, there are now no resident members of Queen Alexandra’s household. Members whose presence may be required are notified of the fact and they go to Marlborough House in the morning. The usual afternoon tea service used at Marlborough House is one that was a present from Queen Victoria to Queen Alexandra when Her Majesty became engaged to King Edward. It is an old Georgian service that was once in the possession of Queen Charlotte, and is probably the most valuable of the many tea services in the plate room at Marlborough House. Among the most frequent guests at afternoon tea at Marlborough House are the Marquis D’Hautpool and Lady Dalkeith, who are both old friends of Queen Alexandra. The Princess Mary is a very constant guest at afternoon tea; the Princess is generally escorted to and from Buckingham Palace by her governess, but occasionally comes with one of her elder brothers. King George and Queen Mary are, of course, also very constant guests at afternoon tea at Marlborough House, but when Their Majesties are present there are never other guests except members of the Royal family. In the summer time, when the weather is very fine Queen Alexandra and Miss Knollys nearly always have tea in the conservatory when by themselves, and Her Majesty frequently gets through a portion of her correspondence here in the summer afternoons, but guests are not entertained in the conservatory. Queen Alexandra, when in London, I sometimes honors some of her more intimate friends by going to afternoon tea at their house. Her Majesty’s hostess is notified in the morning of Queen Alexandra’s intention of taking tea with her in the afternoon, and the lady so honored must, of course, deny herself then to all other callers. This is an established rule of etiquette that anyone who is in the royal entourage understands and observes. In this connection a rather amusing incident once occurred which may be worth telling. It happened in the late reign. 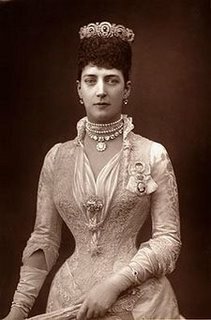 Queen Alexandra went one afternoon to tea with a friend who, of course, instructed her servant to deny her to other callers whilst Her Majesty was with her. Now the servant had only recently entered the lady’s service and was not very familiar apparently with the appearance of Royal personages, and he, therefore carried out his mistress’ instructions rather too precisely. It happened that whilst Queen Alexandra was with her hostess the Duchess of Fife also called, but Her Royal Highness was gravely informed that she could not see the lady whom she called on as the Queen was with her. This announcement induced the servant to show the Royal caller upstairs, though the doubtful look still lingered on his face and didn’t quite vanish until he observed the manner of the greeting that took place between his mistress and the Royal visitor. Invitations to afternoon tea at Marlborough House are by the way generally written personally by Her Majesty, but even if the invitation is written by Miss Knollys it is never given in the form of a command. It is couched in the informal language a lady would ordinarily employ in giving a friend a quite informal entertainment. It is the custom for anyone asked to Marlborough House to write her (or his) name in the visitor’s book on her arrival. This is a custom adhered to at all Royal residences. The old visitors’ books at Marlborough House contain a collection of autographs that form one of the most valuable of such collections in the world. The signature of practically all the most notable people in every country in the world may be found in these books. Li Hung Chang’s, the German Emperor’s, Lord Rothschild’s, Mark Twain’s, Gladstone’s, are some of the signatures that one may detect in glancing over these autographed pages. On one page occurs the name “Olaf” written twice; the first signature got blotted, and the blot did not please the little Prince, so he insisted on writing his name again. conservatory, there were seldom any other guests, and after the Princess of Wales had performed her duties as hostess the lovers were usually left to entertain themselves. The birth of the Duke and Duchess of Cambridge’s son, the as yet unnamed Prince of Cambridge, marks the first time four generations of ruling and future monarchs have lived since the reign of Queen Victoria. 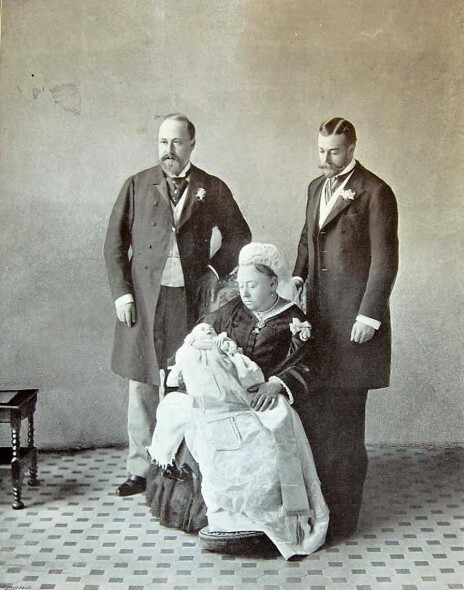 In the following photographs you see Queen Victoria, the Prince of Wales (future Edward VII), the Duke of York (future George V), and Prince Edward Albert of York (future Edward VIII, later Duke of Windsor) in 1896–the year of Edward VIII’s birth–and 1901.